The last of the Sickert school of art with a timeless quality. 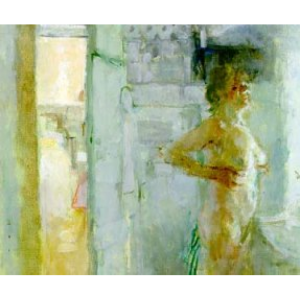 Married to Diana Armfield RA, they are both painters of light; she primarily paints landscapes as well as flowers whereas he paints landscapes or interiors with figures. He is the author of several books on painting and his work has been reproduced in many more. He virtually always sells out at his one man shows at Agnews and at the Royal Academy the question is whether he sells out on the first or the second day. His work is in many important collections including the Royal Collection, Vatican Collection, The Tate Gallery.